One feature that works on some people’s accounts but not others' is the ability to find profiles associated with a mobile phone number. Just type the number into the search box. If it doesn't work, try adding the country code or log into another Facebook account. You can usually find someone's profile by searching for the email address they used to sign up for Facebook. Email addresses can sometimes be found online. Corporate email addresses, for instance, usually run to a format and can be worked out. Many people will use one of the top free email providers and, if paired with their name or regular online username, you can have a pretty good guess when trying to find a tricky profile. 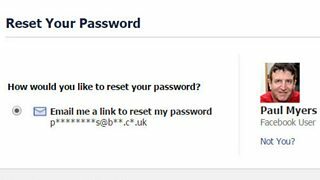 Anyone can see a partially redacted version of your email address by simply clicking on ‘Forgot Your Password?’ on Facebook's log in page and entering your user name. People on your friends list can probably see your email address even if you haven't disclosed it on your profile. You can find your friends' email addresses by pairing your Facebook account with a Yahoo email address, logging into Yahoo email and choosing to import contacts from your Facebook account. These privacy concerns can be addressed by checking your Facebook privacy settings and by using a unique, non-guessable email address to sign up. You may have made your friends list ‘private’ but people can still see who has 'liked' your pictures. 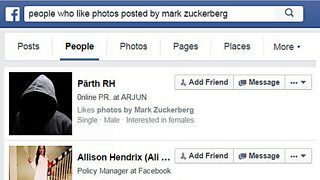 Many of your friends will have clicked ‘like’ on some of the photos you have uploaded and a list of these people can be obtained by searching for 'people who like pictures posted by' you. Additionally, anyone who ‘friend requests’ you will see your private friends suggested to them as 'people you may know', whether or not you accept their friend request. I find Facebook's search really inconsistent. Different accounts have different search features, so if you have no luck using your own account try using an old account or getting a friend to search for you. And you may get a much better search facility if you change your language setting to English (US), instead of your native tongue, in general account settings. You only usually see notifications of messages sent to you by friends. Sometimes you'll get a message in your inbox from a friend of a friend, but if the message comes from someone you don't know you will not be notified and the message will not appear in the inbox. Instead it goes into the section called ‘Other’ when you open your messages. There may be a pile of emails in there that you haven't seen, and this may also be the reason why possible contributors/contacts haven't got back to you. These codes are useful as they allow you to specify a person, place or thing in advanced Facebook searches. You can find this code by visiting http://graph.facebook.com/ user or page name. For example, Mark Zuckerberg's user name is Zuck. This can be seen in his Facebook profile's web address: http://www.facebook.com/zuck. 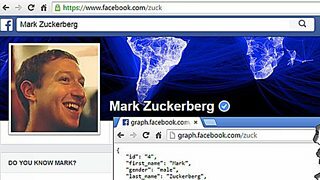 You can find his profile ID code by visiting http://graph.facebook.com/zuck (see top image). Mark Zuckerberg's ID is 4. Most IDs are much longer! The same technique also works for subject pages on Facebook.